» Smart Roofing, Inc. – Bellaforte Shake Shingles SMART Roofing Inc: Chicago Roofing Contractor, Roof Repair, Installation, Hail Damage, Hail Storm Damage Smart Roofing, Inc. – Bellaforte Shake Shingles Roofing Contractor - SMART Roofing Inc: Roof Repair, Installation, Hail Damage, Hail Storm Damage. It happened recently to the Matthews family in California. A chimney fire caused by hot embers and ash got through the spark arrestor and ignited the dry, combustible cedar shake roofing at the top of the chimney. Fortunately the Alameda Fire Department responded quickly to stop the fire from entering the living areas. 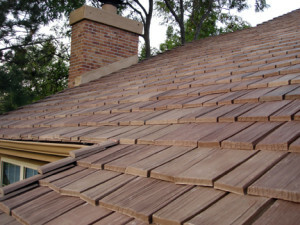 However, the damage to the roof was severe, requiring the old shake shingles to be replaced. This entry was posted in News, Warnings. Bookmark the permalink.